Performing since a school boy, and loving every minute of it! Adam enjoys playing a wide range of music, but prefers whatever will get the audience in front of him up and partying! Mike the guitarist has been playing for 20 years and has a wealth of musical experience available at his fingertips. He has also been involved with some of New Zealand’s best musicians such as Riki Gooch from Trinity Roots, and has close collaborations with the producer, Warren Mendonsa (Blackstratblues). Mike has also toured the Indian Circuit extensively and has enjoyed playing internationally and here in New Zealand with some of the best in the business. He is also an excellent bassist and is always up for a jam! Great, solid drummer (who also rents out our PA gear when it’s available, see here for details! 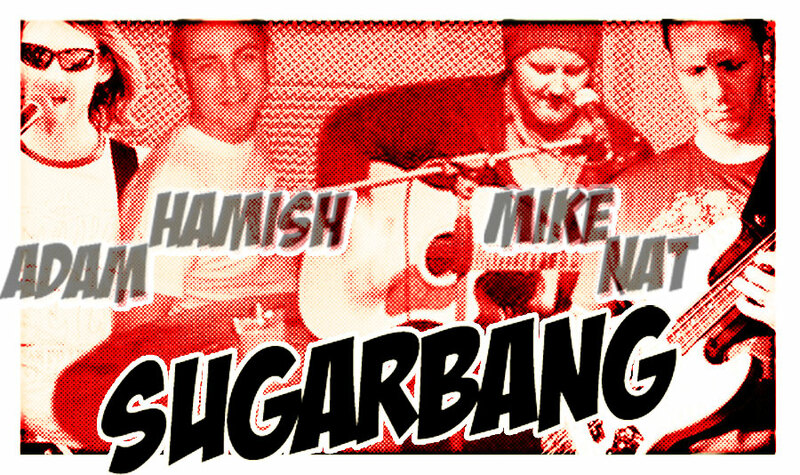 ), Hamish can be found drumming for Sugarbang or running quiz nights. He loves light beers and having a great time. Woot. Nathaniel’s musical career started in garages in California in the good ole U.S. of A, then jazz bands and choirs throughout Washington and also blues and R&B bands in Arizona. Nat played in an 8-piece soul/funk band called Wonderstruck before moving to Auckland in 2008 and then found SugarBang a year and a half later. Of note Nathaniel toured the Northwest and backed Michael Bruce, Alice Cooper’s lead guitarist, on a few gigs, always having fun along the way. Nat is never without his trademark cheeky smile!